Resweber was born on May 2, 1936 in Lafayette, Louisiana. She graduated from Mount Carmel High School and attended the University of Southwestern Louisiana. She is generally recognized as a dedicated Community leader of St. Martinville and was named Outstanding Citizen of St. Martinville in 1965. As a member of the Historic District Commission, she was instrumental in the creation of the Acadian Memorial concept and project. 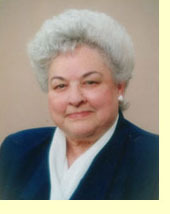 Later, as a charter member of the St. Martinville Heritage Center project commission, she was instrumental in the creation of two museums, The Museum of the Acadian Memorial and The African American Museum. She has received numerous awards over her career but one special award stands out from the rest. Last year at the 2004 Congres Mondial Acadien, Patricia Resweber was named “La Dame Beausoleil” by the Famille Beausoleil in Nova Scotia. The award certificate was signed by Sheila Broussard of Nova Scotia and the late J. Maxie Broussard of Lafayette, the former association president who signed the award shortly before he passed away last June.